Electric bikes, Fuel Cells, Solar Cells, Successor Energy Systems and Devices...all these soon to be available at this location. Besides our kits for biking-triking on less extreme slopes, we are now taking orders for more demanding applications. 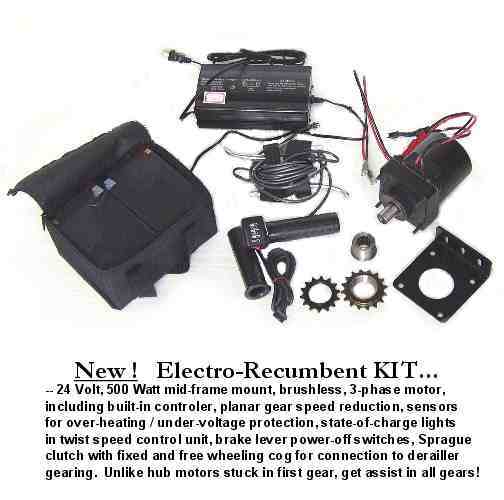 perfect for cargo and pedi-cab trikes These "high power" kits include the hub motor, voltage and speed controllers, brake levers with automatic power shuff-off switches, and spokes for your specific wheel size. The kit does not include batteries, charger, or rack mounts. 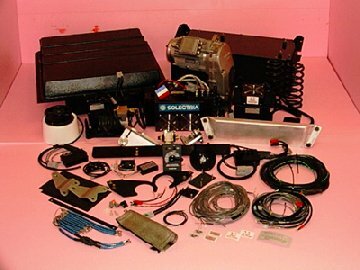 This kit now costs $500...for motor models we stock in inventory, $600 for special order. Add shipping from San Francisco to your location. Expect your complete e-conversion (incl. battery/charger) to cost at least $650...more, depending on battery type, size and charger. Also, for special orders, expect a 3 to 6 week delivery period after we receive your 50% deposit. (Note: this is a peak power rating, with ~ 2/3 to 1 HP sustained rating. 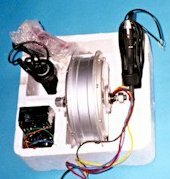 Hub Motor for 16", 20", 24" and 26" wheels...front or rear installation. Speed varies from 16 MPH to 27 MPH, depending on wheel size and "standard" or "high" torque model used..
Power Source: 48V -7Ah, 12Ah, or 17Ah Battery. 48V 12Ah battery is ideal. Unique patented direct drive system for reliable operation in the water, rain, snow or mud. Excellent acceleration with strong torque. Free wheeling feature eliminates drag and friction when pedaling or coasting when the motor is off. Hub motor does not need maintenance as it is fully sealed at the factory. Handle bar mounted thumb or twist grip throttle with variable speed control. Full 2 year warranty by manufacturer. Ask about premium battery options for lighter weight...longer lasting power! Mid-frame mount for higher speeds and less weight. During the colder months ahead, we will be testing these to make sure they are "bug free" before we release them next Spring. Our customers can be assured these kits will offer the highest value and function possible...as our CHARGER bicycles have been for our many loyal customers. For heavier vehicles, contact us for a kit to suit your needs! Remember nickel-zinc battery pack options are 2/3 the weight of lead acid and could provide twice the driving distance depending on total vehicle weight. Like to be on our e-mail list? Ask about other products and how to take part in our VOLUME PURCHASES ! Tell us your needs and we will help you buy it cheaper! Apply now to be a dealer! 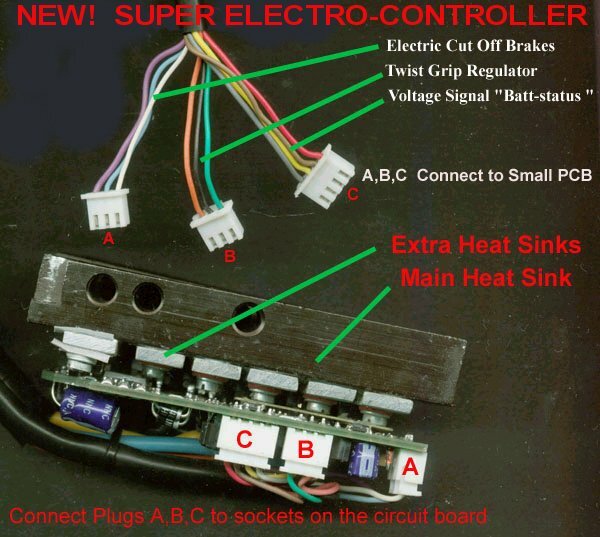 This page was designed and built with EZ-Net Tools. Anyone can design their own web pages and upload changes from their own computer. The above products are now instantly available to a world audience of potential customers. Though we have chosen not to include the shopping-cart and automated credit card features of EZ-Net Tools, these features allow your virtual store to be open unattended for twenty-four hours a day...holidays included.